With eleven investigators, the Open Tree of Life project is already a large-scale research endeavor. But that does not mean that they can add all 1.9 million known species to a database by themselves. In fact, they are looking for help. The main goal of the project is to merge all existing phylogenetic trees in one overarching tree of life. In the past few months, the researchers have been working on software applications to make it possible to store all known species and, more important, to specify how they are all linked to each other in evolutionary terms. The group has already started some internal testing of the system. “Some of our labs are adding trees to give feedback to the members who are creating the computer systems, so we can see what works well and what needs some adjustment. We will work on it until the end of next month and then publicize a data curation sprint, so that other people can submit trees and provide immediate feedback about the software,” says Karen Cranston, the principal investigator of the project. So how can other researchers become involved with the project, right now? The database only publishes phylogenies for which the data (tree and alignment files) are available. Scientists can use tags to track data availability when they upload the papers to the Open Tree of Life library. For instance, with the tag treebase it is possible to indicate that the data are located in TreeBASE and the tag datadryad when the data are available in Dryad. As the project’s database consists of digital records, it means that not every tree that has been published in the past decades can easily get a place in the Open Tree of Life. This is because a lot of the generated data has not been stored or made accessible to the public. This entry was posted on September 25, 2012 by robinblom. It was filed under Building Open Tree, We need your help! 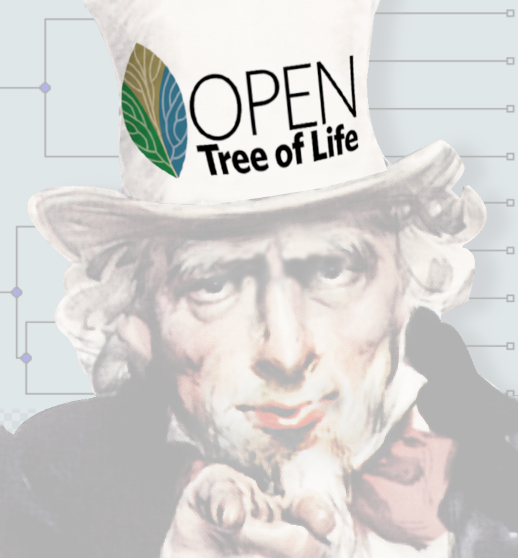 and was tagged with #opentree, biology, digital data, Dryad, Mendeley, nsf, open science, open tree of life, phylogeny, research, taxonomy, TOL, TreeBASE. This is a very good write up thank you for the info-Thank you for sharing.